There will be no Open Sewing on Friday, May 4th. We will be setting up for . 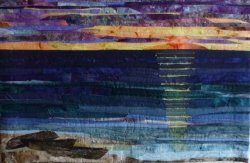 . .
Art Quilt Show -- May 5th -- Join us as we feature Art Quilts by Connie Warshall. Winner of numerous awards for her work, Connie is a member of the group Women Who Run with Scissors and will be in our classroom. You will be amazed at these beautiful works and will be able to talk to Connie about her upcoming class at the shop in June. Come and join us to see just what fabric can do!